Oh my, almost every Short Take in this Summer 2017 issue is a poem! How did that happen? Not because we went out of our way to choose poetry, I assure you. There is a perfectly good – no, absolutely fabulous – poetry section in every issue of Persimmon Tree, so normally we feel no need to include it here. But this time around, unlike most, there was not only a plethora of poetry among the submissions, but it is astonishing. 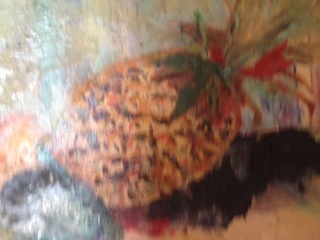 It is singing and sensuous and dripping with the warm, sweet juices of summer. It is – in a word – very like a fruit. Oh. My. I think perhaps we’ve figured it out. Figured out, that is, why we received so much poetry (and such spectacularly pulpy, yummy, juices-running- down-your-chin poetry it is) in response to this issue’s call for Short Takes. Because Short Takes this time is all about fruit. And there is – who knew? – a synergy there. Fruit, as these poems remind us, is very good to eat. There is something sensuous in the enjoyment of a cool ripe plum on a hot summer day, something almost sinfully delightful in the way a crisp red apple complements a long, good book on a September afternoon. Fruit is so good that it is hard to remember that fruit is, mostly, good for you, too. Right up there with vegetables on the handy FDA food chart. And yet, somehow, fruit has escaped all the negativity heaped on vegetables. 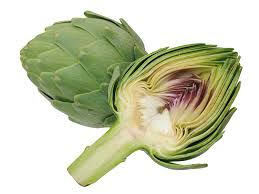 There is no fruit equivalent of the broccoli that one of the President Bushes refused to eat. And very few parents require children to finish their fruit before they can have dessert. Maybe that’s because fruit is dessert. bursting with sweetness out of this world. 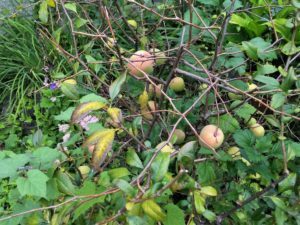 Remember the Hood River peaches hanging over the fence? We rollicked in juice and hungry luck that day. 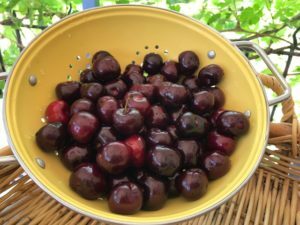 bobbing like fruit in a wash barrel. in that old filling station lot on the back road to Eugene? that we could take what we wanted as if the fruit gave permission. The cherries were all we’d eat that day, living entirely outside the law. to protect them should la Migra happen by. Only knobby knees gave away her youth that day she felt she could not go on. watched the geese, finally slept in the car. Once home I called, offered to come for her now, but she refused. and fell into bed in the liminal dusk. but not so much as the voice on the other end of the line. I wondered if she would live. “We won’t know the damage for several days, if then. Until she moved to the psych ward I stayed. Without someone to watch, she would be tied to the bed. Neither she nor I could stand such restraint. We talked. Her brother carried her to the car she said. over and over again, where euphoria and despair are strange partners. again reached for the needle, her pomegranate. No matter my warnings, no matter my love, poppies beckoned. Nothing was as strong as the taste of the fruit. it is round instead of lemon-shaped. The skin of a peach is thin; it can be easily peeled. But a lemon is thick-skinned and must be sliced. 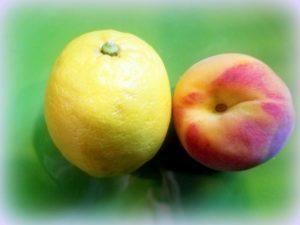 Both a lemon and a peach can be thinly sliced. while a peach has one big pit in it. as you bite into them saying Mmmmmmm. Which never happens with lemons. too hard or too soft; a peach can break your heart. In my memory, the Japanese quince bush was always there, planted by my father before I was born. The backyard where it grew, rolled bumpily down a bit of hillside like the neighborhood itself. Pittsburgh is like that. When I was nearly grown, everything on that street where I grew up, including our home and yard, was reconfigured or relocated to accommodate a highway that would run through the East Street Valley. Thirty years later, driving through my old neighborhood I spotted that same Japanese quince flowering on a hillside, surrounded by the absence of homes. Howard Street was still there, cracked and pitted with potholes, and the quince, crowded by weeds and brambles, sat on the hill behind where my home used to be. I parked, climbed the overgrown slope and carefully uprooted the dear Chaenomeles Japonica with the shovel I kept in my trunk. At home, in a neighborhood on the other side of town, I replanted it in my backyard. A few Septembers later, when the frenzy of spring growth in my garden was just a memory and the end-of-summer grasses grew slowly, before the grapes were fully ripened, I found the quince bush, for the first time since its move, loaded with fruit waiting to be picked. Peering through its thorny branches I was caught off guard by the memory of that other backyard. I remembered standing by that very same bush, next to my father, when I was a little girl. “What’s on the bush?” I hear my small self ask. “That’s a quince,” my father answers, reaching cautiously between the sharp thorns, cupping his broad, rough hand around a quince and plucking it. He shows me the fruit in his calloused palm. “Nope,” and he tosses the fruit aside. “You can’t eat ‘em. Too hard and sour.” He pronounces the word “sour” like a Pittsburgher, squishing the vowels, making a word as blunt as his workingman’s fingers. We called our neighborhood “Norside,” preferring also to ignore some consonants in our speech. Back then we edited out of our blue-collar existence anything that didn’t make sense, anything extra or useless. We questioned anything and anyone that didn’t step up and do its job, like a bush that made beautiful blossoms but bitter fruit. We never ate the quince back then. In the years since, I think I have learned how to love my past and the people we were, and the same time to embrace a broader world view. One that accepts more. That fall day, in my grown-up home, I pulled the quinces from their spiky limbs and cooked them in a shiny pot with apples and lemon zest, the juice of the lemon, too, and a pinch of cinnamon. I sweetened the pot with lots of sugar, sweetening the past at the same time. 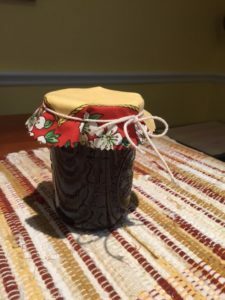 When the jam cooled, I spread it on warm buttered toast and ate, savoring the memory of places and people long gone. compress and carbonize to shadow. sit beside my husband’s grave. How hungry must that person have been? The very heart is all that’s left. Where the true treasure has been hiding. It is this that makes the tedious unveiling worthwhile. One delicious mouthful dipped and dripping. Then takes it all into my mouth. Without a doubt, well worth the wait! scurry by, a hazard for tentative walkers. if no crumbs fall for them to munch. over excited, a panoply of excess. Mango juices slither down our chins each morning. Papayas ripen on the windowsill, lie in wait. Cinnamony Chicos substitute for sugar. Guava plays Cinderella to sexier cousins. blah taste, can’t live up to that dream name. compete with grapefruits in size. to reach a neighboring farmer’s stall. in Kauai even that is lushly tasty. by scarcities imposed by WW II. Fowls, fruit, flowers — color unrestrained. Couples, too, in wide ranging hues. with its offspring emerging tea-colored, accepted. lost in the airless mash beneath. for a pick-up game with ball & bat. jelly the way my grandmother did. in the neighborhood had thought to try. again, so that I never sleep. where he had lived as a young boy with his grandmother. who still spoke to him in his sleep. and wade right back to the beach. twisted gray twigs that held pink and white petals. 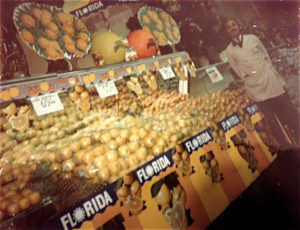 Food Fair, Penn Fruit, and others, all of which are no longer around. Got rid of the old produce out front, and replaced it with the fresh fruit. The reds, and greens, would blend into the yellows and oranges. I can see in my mind’s eye, him standing back and assessing the effect. Did the fruit look appealing and colorful? Perhaps like a Cezanne painting. He got to bring home (for a small charge), the fruit that was no longer saleable. Not so much rotten, but no longer pleasing to the eye. Most of the fruit would be mixed with Jello to make our favorite dessert. Into the cherry gelatin would go soft, brownish bananas, red and yellow. A summer sunset. 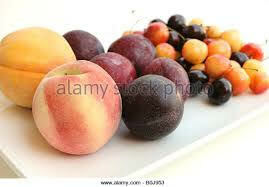 Our favorite was when mom mixed three or four fruits together. We needed to eat them fast, so she created a rainbow of colors. Whiteness of the smock looks like a still-life. Perhaps on purpose. Title: Self-Portrait of the Artist with Fruit. View More: Next piece "The Cleaning Women", Home, Archive. How is your collection going. 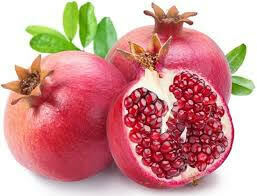 Judging from the Pomegranate poem, it will be a fine and important collection. My collection is in editing now. I’m calling it Notes on Serenity. I’m wondering if, when I get a proof copy, you might be willing to write a blurb for my back cover. I’d be willing to do the same. It is very difficult to proceed through this work as it becomes overwhelming. I laud you and encourage you to keep on. I know this note comes a year after your poem, but so goes the slow part. Best wishes from another mother . . .
Why are so many of your pieces so sad. 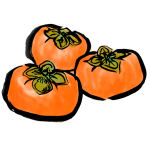 Persimmon never publishes anything funny or humorous. I know we live in troubled times, but it would be nice to read a few pieces that show humor, an essential to life! If you send us some funny pieces, we will use them. The Japanese quince bush piece was especially lovely–and so very Pittsburgh!! Love it! Once a Pittsburgher, always a Pittsburgher. Where are you Joann? I’d love to write with you. Loved Joann Kielers’ quince piece, especially her jam “recipe.” My mother loved quince jam/jelly. Hard to find. I keep searching. Love Joann Kielar’s quince piece, especially her jam “recipe.”. My mother loved quince jelly – I look for a jar every time I go to a new market — hard to find. Joann was motivated by memory. Me too. Beautiful poem Judy Harding! How quickly you transport us to other realities. Thank you for sharing! Your mother of an addict poem struck deeply. So glad I’m not the only one writing poems along this line. I have a small collection now. Working towards a book . Is someone anthologizing mother-of-the-addict poems? We must give voice to this illness and sorrow. Thank you for this beautiful and heart-wrenching piece. Thank you for your comment. I agree that someone should be working on a book, an anthology, of poems of mothers of addicts. I am working on a book of poems about addiction. The going is slow because I can stand to write only so much at a time, but I believe this is important work. The Arlo Guthrie audio was so true and difficult to listen to. However, it was a beautiful and poignant song. Thank you for sharing it. The Arlo Guthrie piece moved me to tears. This section touches me in so many ways. We had a horrendous winter. No apricots, no apples, but pears and plums to wait for: natures bounty and beauty as a kind of optimism of continuance. The poetry section is a powerhouse of art and images. Thank you all.